Some of you may already know that I have an affinity for the Virginian Railway. Something about the railroad has always intrigued me since my love for railroads materialized young in life. The former Virginian was one of the places I first visited as a railfan. When I first began taking pictures, my dad took me to the community of Whitethorne, Va., at the base of the climb to Merrimac. 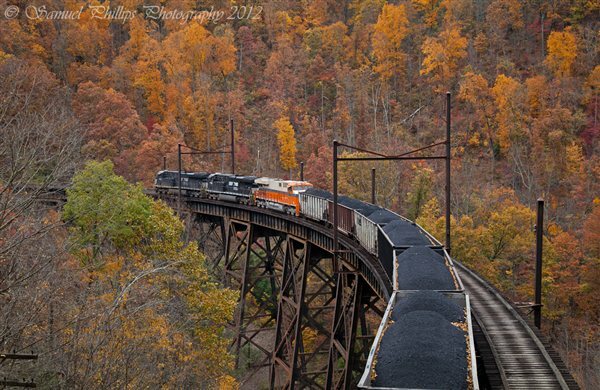 I remember watching loaded coal trains stopping for helpers, then taking off a few minutes later shaking the ground as the engines worked hard to get the heavy train rolling again. This is definitely one of my favorite experiences! Since then, I expanded my knowledge of the Virginian by reading books and exploring new territory. This past summer, I embarked upon my first trip to explore the Princeton-Deepwater District, witnessing some of the most impressive trestles and stunning scenery I had ever laid my eyes on. I marveled at what I saw that day, and when I returned home all I could think was, "When can I go back?" In this brief tour, I will examine my all-time favorite section of the Virginian, Clark's Gap Grade, spanning from Elmore Yard to Weyanoke (near Matoaka). I will explain why this location has become my favorite and what makes it so special. Opened in 1909, the Virginian instantaneously became a prosperous railroad from Norfolk, Va., westward to Charleston, W.Va. The railroad was able to tap into rich coal country and transport immense quantities of coal to the coast quickly and efficiently. Henry Huddleston Rogers funded the railroad construction, using the best materials available at the time. His close friend, Col. William Page, oversaw and implemented construction plans, while Huddleston stayed behind the scenes. Upon its opening, the grade from Elmore to Clark's Gap posed a huge challenge for the Virginian. The 2.07 percent Clark's Gap Grade immediately persuaded the Virginian to acquire some of the world's most powerful steam locomotives. The railroad implemented a plan called "Hill runs," denoting a move that would take 4,000 to 6,000 tons of coal up the grade to the small yard at Clark's Gap several times daily. Later in the day, a train would fill out at the gap with 8,000-10,000 tons before proceeding to Princeton and eventually Roanoke. Trains usually operated with a 2-8-8-2 on the head end, assisted by a pair of 2-10-10-2s on the rear. Even with three powerful locomotives, the process was slow, moving at a steady 7-mph pace while climbing the mountain in good conditions. When rain slickened the rails, the process was slower. The operation worked, but was slow and posed hazards for the crews. Another major problem was lack of ventilation in tunnels Nos. 9, 10, 11, 12, and 13, which meant crews almost suffocated. In 1923, the employees went on strike until the railroad improved what strikers dubbed “hellish conditions.” In response and hoping it would solve the issue, Virginian management decided to electrify 133.6 miles of the main line between Mullens and Roanoke. The Virginian’s competition, the Norfolk & Western, had already electrified part of its Pocahontas main line (between Iaeger and Bluefield, W.Va.) to move coal over Elkhorn Grade more quickly and efficiently. In 1925, the Virginian completed electrification and a fleet of EL-3As (dubbed Squareheads) arrived from Alco-Westinghouse to start work in the electrified territory. Operating in sets of three, each unit produced 2,375 hp along with 92,500 pounds of tractive effort. The Squareheads were a success and exactly the solution the railroad sought. A 6,000-ton coal train powered by electric locomotives could climb the grade at 14 mph, double what steam-powered trains previously did! Historians say the Virginian operated one of the most successful electrified railroads ever. I must agree. The Virginian used the electrification to overcome a plethora of problems posed by the mountainous territory and operated with the best equipment available. The Virginian acquired a noteworthy electric locomotive in 1948, the General Electric-built EL-2B (the railroad dubbed them Streamliners). Operating in pairs, they were 6,800 hp and produced a tractive effort standing at 275,000 pounds. They became known later as the world's most powerful electric locomotives. After the Norfolk & Western acquired the Virginian on Dec. 1, 1959, the electrified portion managed to survive only 2 1/2 years. In July 1962, the last electric-powered train arrived in Roanoke, and the power was turned off. Shortly after, everything from electric locomotives to catenary poles were either sold or scrapped, thus ending the Virginian’s era of electric railroading. Today, few signs of the electrification remain within the 133.6 mile stretch from Mullens to Roanoke. A few catenary poles have managed to survive on viaducts east of Elmore, but other than that, most all signs have been eradicated. Several Virginian searchlight signals still remain along the P-D district, but they are falling fast to the new Safetran Systems signals, which are quickly replacing old signals across the U.S. While signs of the past disappear, the Virginian will live on in the hearts of many forever. Old viaducts that denote the Virginian's well-designed railroad remain intact along the route, along with an old depot and multiple tunnels, making this a unique railroad even today. And lets not forget the infamous Clark's Gap Grade that still poses a major challenge for Norfolk Southern operations! Situated at the bottom of the grade lies Elmore Yard in Mullens at former Virginian milepost 374. 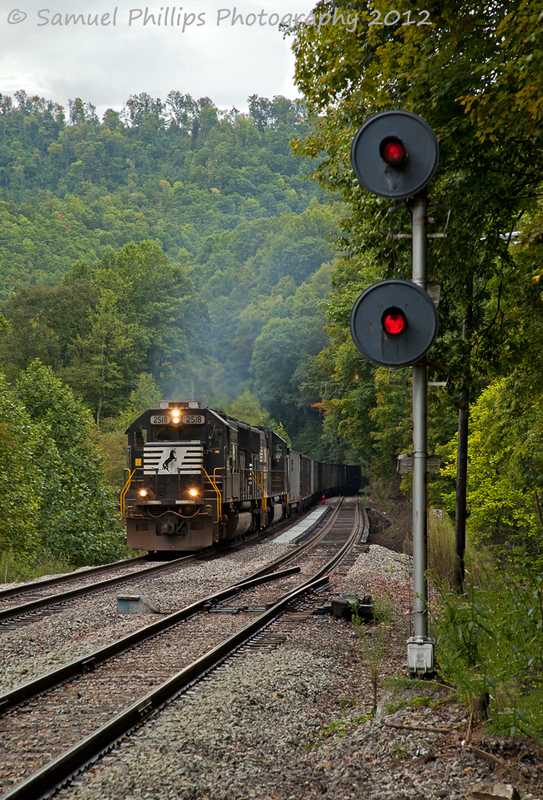 Elmore Yard is a crew change point and helper base, along with the beginning of the Guyandotte River Branch, which spans 42 miles south to Gilbert, W.Va. When eastbound loads come off the Guyandotte River Branch or Winding Gulf Branch (at the west end of the yard), they will pause here to acquire a set of three helpers for the climb to Clark's Gap. Eastbound loads coming from Deepwater already have helpers attached because of severe grades that lie timetable west of town. Norfolk Southern still uses the hill-run method of operation, except that most trains are much longer and heavier than the ones the Virginian ran. Using four to six units, NS usually runs anywhere from 50-100 loads at a time up the hill, where the cars are set off for a later train to use to fill out to at least a 150-160 loads before journeying east to Roanoke. However, not all fill out at Clark's Gap. Some trains are run throughs that will keep just 100 loads for the journey east. 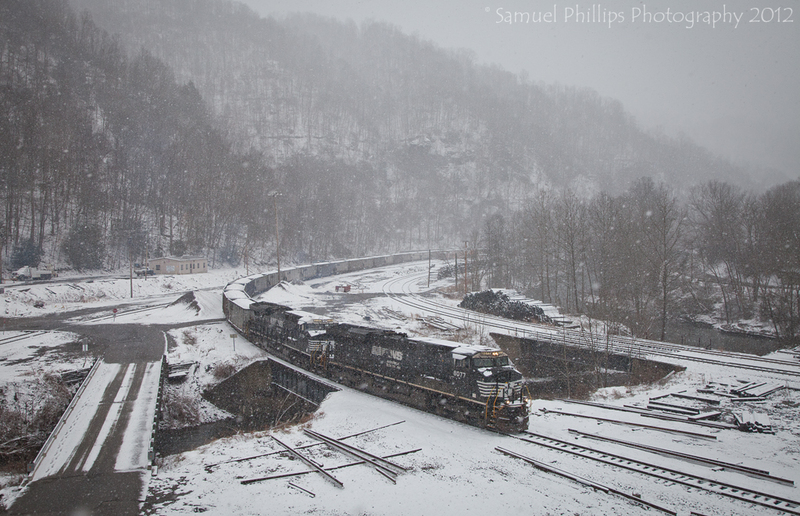 On a snowy afternoon, two NS 4,400-hp GE ES44ACs lug a string of 50 loads off the Guyandotte River Branch and into the yard at Elmore to be used for a hill run set to depart within the hour. This day, the train will only take 50 loads up the hill with five motors due to the fleeting conditions that will cause wet-rail and hazardous conditions on the hill. Even with 5 high-horsepower motors, it will take the train more than an hour to climb the hill to Clark's Gap. This panorama gives an individual an idea of the track-layout at Elmore. The track in the near foreground is the east leg of the wye, which connects to the Guyandotte River Branch. The track in the backgroud is the main line, and the brick building is the yard office, which sits near the west leg of the wye and helper-storage track. The yard was empty this balmy fall day, as maintenance of way was working on the single-track portions of the railroad, tying up most of the operations. The first impressive trestle outside Elmore lies within the town of Covel, situated 8 miles east of Mullens. Covel was constructed when the Virginian was built and new mines opened, becoming a town for the miners and railroad workers to reside. Although the community used to be a booming place, nothing more remains other than a post office and several houses beneath the viaduct. An old mine used to occupy the hillside behind the structure, but has since been abandoned and vegetation has taken its toll. 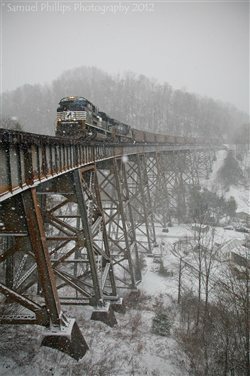 A snowy trackside view perched above the town of Covel yields to the passing of westbound empties returning from the coal fields behind a set of AC motors on the descent to Elmore. The train battles fleeting conditions as snow piles up and gets deeper and deeper while descending the hill from Clark's Gap. The train will soon arrive at Elmore and the crew on board will tie it down just east of the yard office. On a stunningly beautiful Autumn afternoon, train U86 grinds uphill across the town of Covel, permeating the air with engines in notch 8 struggling to keep the train of 100 loads rolling uphill. 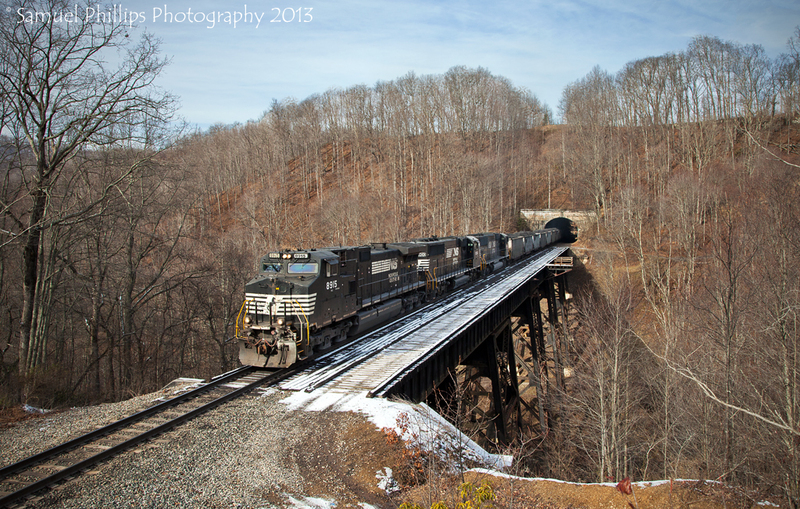 EMDX 2012 makes a surprise visit to the former Virginian, as it proudly leads the train eastbound toward Princeton. Scenes like this show why I love the area so much. The impressive viaducts and the sound of trains on their knees climbing the grade just makes me want to go back again and again! The next impressive viaduct and first tunnel east of Elmore lie within the little community of Garwood, which is situated roughly 9 miles east of town. Garwood is smaller than Covel, just a couple of houses and a sign denoting the small area is all that would make one aware of it. The viaduct itself is 720 feet long and is one of the few that still has catenary poles intact, making it a place that still screams "Virginian." With gorgeous autumn colors popping, thus making the hillside behind the trestle appear "on fire," train U86 roars eastbound across the curved viaduct while assaulting the hill with roughly 100 loads in tow. Three C40-9Ws working on the head end permeate the surrounding valley with a sound that is heard several times daily, engines in notch 8 climbing the hill and flanges squealing when the train enters the tight curve in the middle of the structure. Tunnel No. 9 is beneath me, and I remember the ground shook violently as the train penetrated the hill below my feet. Several minutes later as they slowly approach my location, the helper locomotives begin permeating the surrounding valley with their sound. Soon, a trio of GEVOs (operating as J92) in notch 8 emerge from the woods and start across the massive structure. Norfolk Southern's Interstate heritage locomotive makes a surprise visit making the already colorful scene even more so; also note the fallen leaves in the coal hoppers. The old town of Micajah is situated about 1 1/2 miles west of the top of Clark's Gap Grade at CP Algonquin. Once an actual community and prosperous town, the hamlet seemingly disappeared and was lost in time back in the ’40s or ’50s. Nothing remains today at the site other than a lengthy viaduct and Tunnel No. 12 situated on the west side. The location is only accessed by a long walk and/or an ATV. There is a plethora of ATV trails and roads throughout the hills surrounding this location, but it is challenging to find the one that actually leads from the highway to this spot! On a chilly January afternoon, train U86 emerges eastbound from Tunnel No. 12 and crosses over what used to be downtown Micajah with a trio of horses commanding the train. Three ES44ACs are shoving hard on the rear of the move, but even with all the horsepower, the train is currently moving at just a "fast walk." After the train tops the hill just ahead, it will stop at CP Clark's Gap to fill out to around 160 loads (equivalent to 21,000-23,000 tns), before proceeding toward Princeton. I could hear the two EMDs on the head end for a solid 20-30 minutes before they reached my location; this is definitely mountain railroading at its best! Weyanoke is small community situated just west of Matoaka, W.Va., that hosts nothing more than several old buildings along with a small neighborhood of houses. Weyanoke also marks the top of the westbound assault from Rock, W.Va. Eastbounds have officially topped Clark's Gap grade at this point and are on a complete downhill run into Matoaka. Weyanoke is also the beginning of a 4-mile stretch of double-track that runs westward to CP Algonquin along with the small Clark's Gap yard where "hill runs" often leave their loads. A duo of old standard cab EMDs puff out some exhaust while climbing the final leg of their westbound assault from Rock, as they come past the Virginian searchlight signals at Weyanoke with hopper train U89 in tow. Since this photo was taken on Sept. 1, 2012, the searchlights have fallen to new Safetran signals. The changing of the guard took place Dec. 3, the sad day another Virginian relic fell. 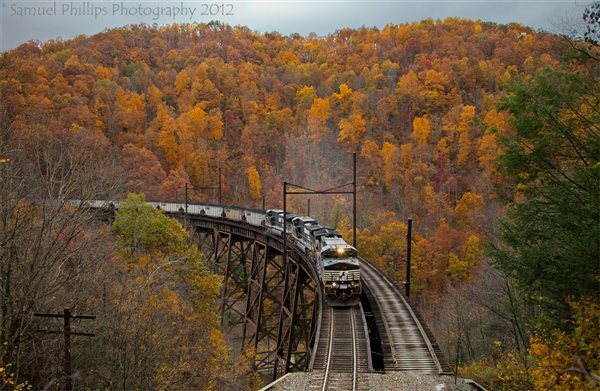 The magnificent trestles and scenery along with intriguing history make the Virginian my all-time favorite place to railfan. 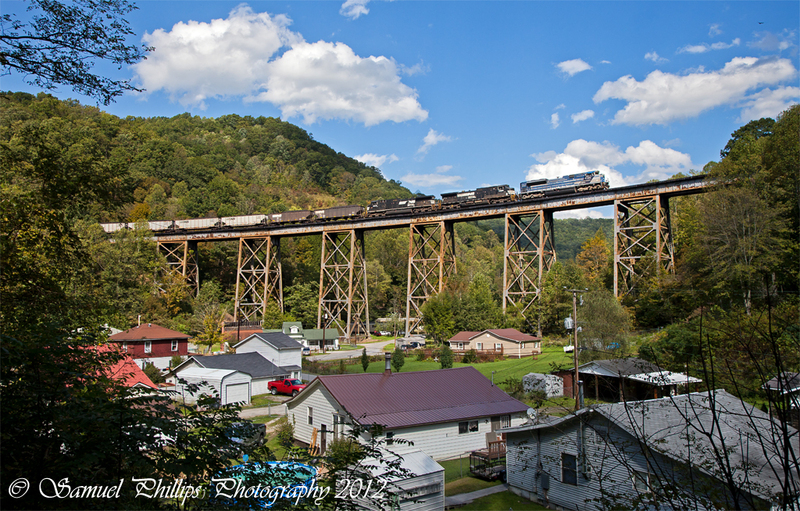 Even though traffic can be sporadic, just witnessing one train climbing the hill to Clark's Gap and passing through some of these pictured locations make the trip and time totally worth it. After exploring this railroad last year, I know I will have an affinity for this area the rest of my life. The urge to return to the P-D is constant, and I am always itching to get back. Thanks for joining me on this tour of what once was the amazing Virginian Railway. Thanks for looking and hope you enjoyed the read and photos. Please leave your feedback in the comment section below.